Acne scar removal is usually made up of treatments that stimulate new collagen in order to ‘fill in’ or plump up old acne scars. Acne scarring is formed when the skin sustains injuries from acne. Acne scarring can be made worse by the trauma caused by picking and squeezing pimples as it can force infection deeper into the skin. Image by laser suggest a variety of treatments for acne scar removal including fractional skin resurfacing, laser facials, IPL and skin needling or dermal rolling. These different treatments all aim to stimulate new collagen growth which in turn will improve the texture and appearance of the skin. As an added bonus, you may notice an improvement in the size of your pores and fine lines. 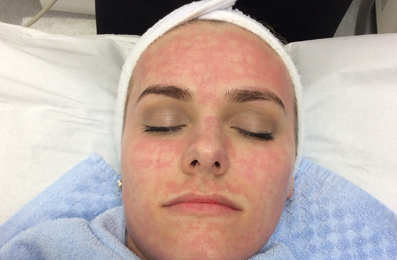 The treatment that is best for you will depend on the type of acne scarring that you have – we can recommend the best treatment for you in a free consultation after we have assessed your skin. Fractional Skin Resurfacing: Small areas or ‘fractions’ of the skin are treated allowing the surrounding areas to remain intact, which means minimal downtime. Skin Needling: Fine short needles that are on a single use roller are moved over the area of acne scarring, stimulating the wound healing response and stimulating collagen. Before undergoing acne scar removal it is best to clear up any active acne with Omnilux Blue Light Phototherapy. If your skin is generally clear then we can proceed with the scar removal treatments. Fractional laser resurfacing uses two methods to breakdown collagen. Firstly, collagen is physically broken down by controlled destruction of old collagen. Secondly, controlled HEATING of the surround tissue denatures, or breaks down the collagen scars surrounding the treatment areas. This controlled heating is what differentiates lasers form old-fashioned Skin Needling – Dermapen Fractional Resurfacing.